What does it mean to be a small business? What are you seen as? Externally, customers see you as a more personal business, willing to do whatever it takes to provide them with great service. To them you’re accessible - responding to every issue they might have in a timely manner. Internally, your business is agile, your employees are scrappy. Everyone from the owner to the new hire is willing to roll-up their sleeves and wear multiple hats to complete the task at hand. But what happens to this culture as you grow? It’s a question many green industry businesses are asking. A little over half of the businesses in our 2016 Green Industry Benchmark Report said they experienced at least an 11% increase in revenue during 2015. And almost two-thirds of these businesses said it was over 20%. So, if you’re one of these growing businesses here’s a few ways to keep that small business vibe. Whether you realize it or not, every business has its own culture. The first step is understanding what yours is and setting a framework for how your employees approach prioritizing, making decisions and handling customers. This isn’t possible without having solid values that aren’t a blanket statement like “be nice”. But instead values that position your business’s mindset like “we value our customers over everything - over speed, profit, etc.”. This provides your employees with a foundation of beliefs that guides the way they operate. Grow with a purpose. Don’t’ just grow because you can. It’s better to be understaffed for a short period then hiring employees who don’t fit your company’s culture. Hiring just one person because you need more bodies has the power to snowball into having a bunch of employees that don’t align with your mission and values. Before you know it your business has lost its identity. The more your business grows the more complex communication gets. As an owner, you should still be talking with those in the field. Of course, this isn’t possible all the time. And you shouldn’t have to hold your field employees’ hand. But If a problem arises and you’re available, be a resource for them - whether that’s as simple as a phone call or driving to the property they’re at. As an owner, all eyes are on you - employees and customers alike. Don’t distance yourself from either. It might take some effort but try to maintain the same close relationship with customers you had when your business first started. An uncle of mine owns a chain of barbeque restaurants down in Texas. Every week he tries to get a shift behind the register at each location, so he can say hi to long-time patrons from way back while also greeting first time customers. And after looking at their Yelp reviews this little gesture makes quite the impression on customers. Just because your focus shifts more towards administrative tasks as you grow doesn’t mean you cut yourself off from the rest of your business. 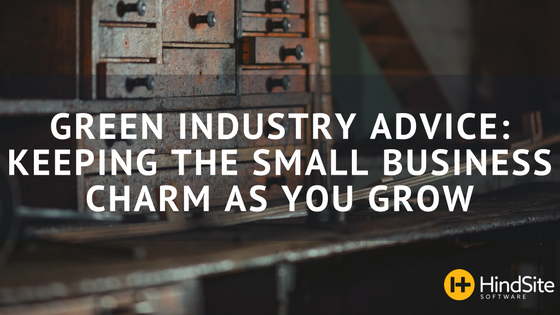 If you’re fortunate enough to have a green industry business that’s growing you’ll likely experience the fear of losing your small business ways and becoming something you don’t want - an out-of-touch owner of a larger, bland, impersonal business. To avoid this focus on what made your growth possible in the first place. The thing you’ve had since the start. Build around these values, reinforcing your mission to every person who climbs aboard. Don’t just grow because you can, but do so with a purpose.